If you ask any graduate of Waseda University what the most popular ramen shop was among their classmates, I would assume 90% would answer Chuka Soba Benten. Benten had been open and operating in Takadanobaba station since 1995 serving up their famously large ramen to starving Waseda students for close to two decades. However, due to certain circumstances, the shop had to close their location around 2014. 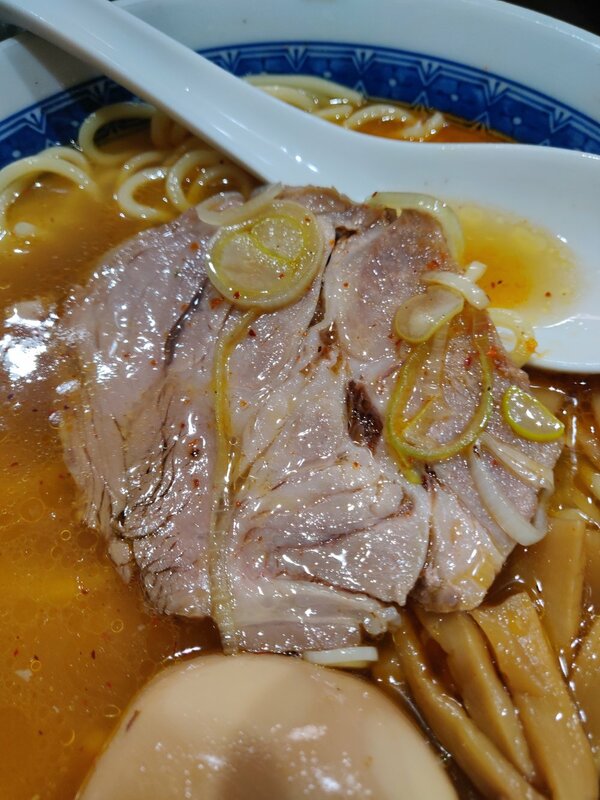 In 2015, a former apprentice of the shop opened his own version of Benten’s ramen in the Takadanobaba district and so when the original owner decided to reopen his ramen restaurant, he opted to move and bring it back from the dead in Narimasu of Nerima, Tokyo. Open from 11:00-14:30 (or until the soup runs out) Monday-Saturday, Benten draws huge lines starting from 10am. If you plan on coming to Benten be sure to plan accordingly and risk having to wait at least an hour before having your bowl. I’m sure you’ll be glad you did as this was one of my favorite bowls I’ve had in 2019. As you can see from the photos above, the line is ridiculously long. Ever since it shut down in 2014, people have begged for the owner to reopen and its been a busy queue ever since. Once you endure the lines and get in, purchase your ticket at the machine and wait for a seat to open. The options available here are (from left to right, starting at the top left) are Ramen, Shio Ramen, Tsukemen, ticket for more noodles, and Tokusei Ramen on the first row. The second row are the toppings of extra menma bamboo shoots, roast pork char siu, menma and char siu, soft boiled egg, raw egg, and seaweed. The third row are side orders of spicy miso paste, miso, beer, appetizer menma, and appetizer char siu. The most popular orders here are the Shio Ramen and the Tsukemen. With the Tsukemen, most opt for the raw egg which gives the soup a nice creamy undertone. With the Shio Ramen, most add on the soft boiled egg. Especially popular on weekends is the appetizer menma and char siu with beer. As it takes a while for the chef to prepare each order, patrons will sit back with some bamboo shoots and char siu while sipping on some beer while waiting for their bowl. The menma has a really thick, sesame and shoyu flavor that pairs incredibly well with beer so it is quite a popular side dish. Once you purchase you ticket, take your seat, and place your ticket at the counter. They’ll ask you what portion of noodles you’d like; Nami (並, 250g) or Chu (中, 350g). If you purchase the extra noodles for an extra 200 yen, it’ll be 700g of noodles. I would suggest the Chu size, but if you’re not too hungry, go for the Nami as you don’t want to leave noodles here and risk angering the owner. 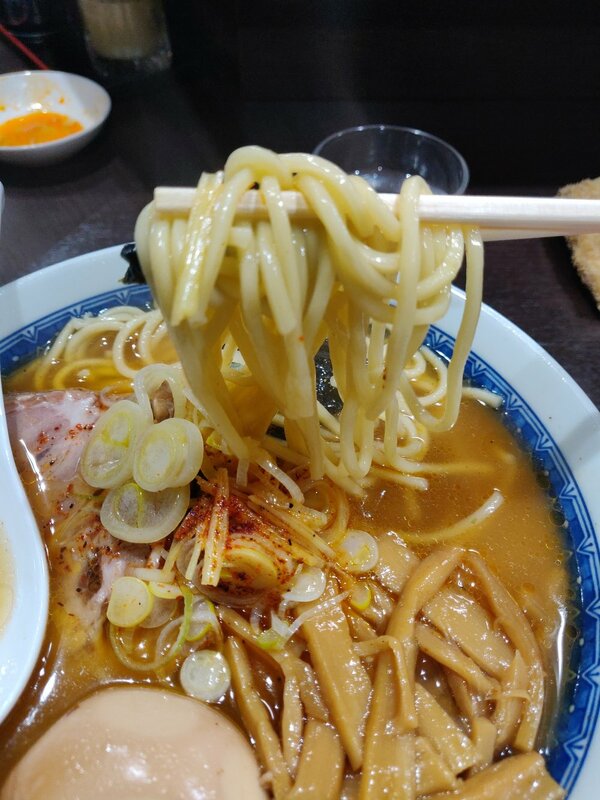 During Benten’s hay days near Waseda University, students would routinely order the extra noodles and be yelled at when they couldn’t finish. I’ve heard it’s not as strict anymore, but best not to risk it. I opted for the Shio Ramen with a soft boiled egg topping on this visit and it came adorned with a generous scoop of their famous menma bamboo shoots, thick slice of pork char siu, handful of green scallions, and a dried seaweed slice in addition to my egg. I chose the Nami size as I was hoping to make it to another ramen shop later that day and I was glad I did as the portions here are huge. As I got my bowl, I was greeted with an amazing aroma of fried scallions as the chef finishes each bowl by pouring hot oil over the scallions frying them up every so slightly. The star attraction here, however, is the incredible soup. The broth is primarily a seafood base, with some animal stock added to taste, simmered in a huge stock pot you can see in the back of the shop. The owner has said its a combination of pork bones, chicken carcass, Niboshi (sardines), and dried Saba (mackerel) shavings, but I imagine a fair amount of vegetables are also added to bring a bit of sweetness to the soup. Although it is mainly a fish stock, the soup has no fishy aftertaste, was incredibly deep in umami flavor, and rich in fattiness. The shio tare is fantastic and accentuates the broth rather than muddy it as a shoyu tare flavoring might. My usual tip when choosing between Shio and Shoyu is that the shio, or salt tare works better with seafood broths and animal stock usually gets a nice flavor bump with the Shoyu tare. Noodles are made in house and really compliment the soup well. It's a very traditional straight, round noodle and has the egginess and chewy texture that I imagine filled up those hungry college students back in the day. The weight I described for each size is the weight pre-cooking, so as they boil, they will retain some water weight, making it even heavier than advertised...so be careful and not to overdo your order. The toppings here are fantastic, but the menma bamboo shoots really shines through and is probably the best I've ever had. Benten prepares the bamboo shoots by thoroughly washing them and then frying them in sesame seed oil to give them a nice crunchy texture. They then saute them in a Shoyu tare giving it a nice nutty, but savory flavor profile. Due to the saltiness of the Shoyu, I can understand why so many customers order it with a side of beer. The roast pork is also fantastic and, while I wasn't able to ask how the chef prepared it, I imagine it simmered along with the broth as it is incredibly juicy, tender, and rich in umami goodness. It has just enough meat to withstand the soup, but a great balance of fat to melt in your mouth as you take a bite. The fried scallions was a nice touch and enjoyed the aroma it provided when I first received my bowl. The egg was cooked to perfection and was runny, but not enough that it would seep in to my soup. I could do without the dried seaweed, but that's probably more my preference that a knock on the overall quality of the bowl. I loved the quality and dedication put in to each component of this bowl and it made me contemplate my next order before even finishing on this trip. Many, I assume regulars, were ordering extra toppings for their bowl and I know I’ll be doing the same after trying them on my simple Shio Ramen order. I actually never made it to Benten when it was popular near Waseda University and was sad to hear they closed just a few years ago. When I heard they reopened to this new location, I was determined to go and I am incredibly glad I did. While the lines are long and shop is a bit small, you forget all about the wait and the other customers sitting shoulder to shoulder once you take a sip of their soup. I definitely recommend a visit while the head owner is still cooking up the ramen as you never know when he'll retire.